Wedding Wednesday: We have a Venue! Even though we have a good amount of time before we tie the knot, we are getting started early. We want to take our time with planning, not only for budget purposes, but so that we are able to enjoy everything and not feel so rushed. Dave and I live about 10 hours away from both of our families, and also the wedding site. This makes for some challenging planning sessions. I can't imagine how stressful it would be if we were trying to do it in a year or less. We booked this space within two weeks of being engaged. We saw a few spaces that same week, while we were in town, but none of them were the one. There was a long list of demands that venues had to fill. Rustic & elegant feel, outdoor/indoor, be able to accommodate a BBQ menu, and must hold 200+ capacity. 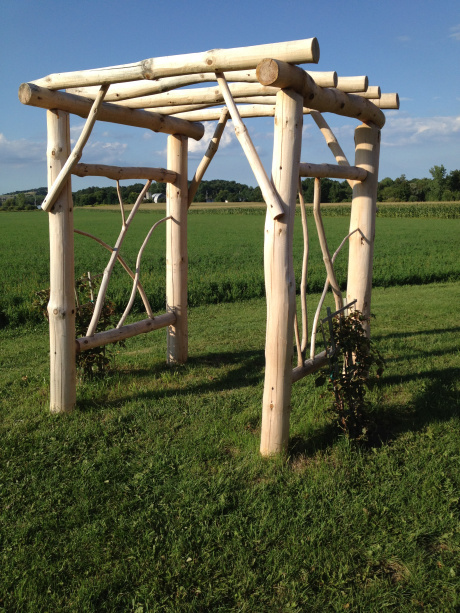 We knew right away that we wanted to get married in the Finger Lakes region, so we started there. 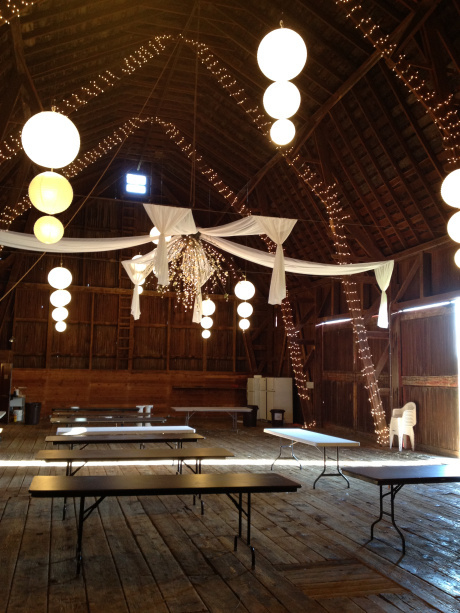 We also were drawn to the rustic feel that many of the barns out there give. Even though I have been to many beautiful weddings in banquet halls, I can't imagine having my wedding in one. Though Dave and I have never seen this space in person, I think this fits the bill. My mom and future MIL are IN LOVE with it, and it even has a seal of approval from the toughest critic, my little sister Caroline. I introduce you to... 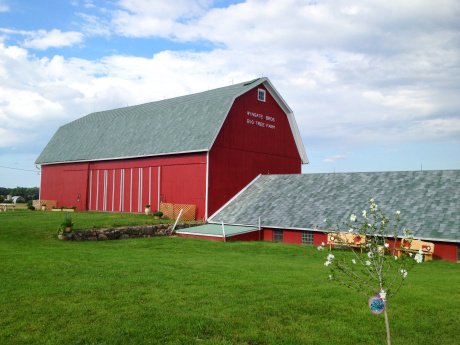 The Wingate Barn on Big Tree Farm. 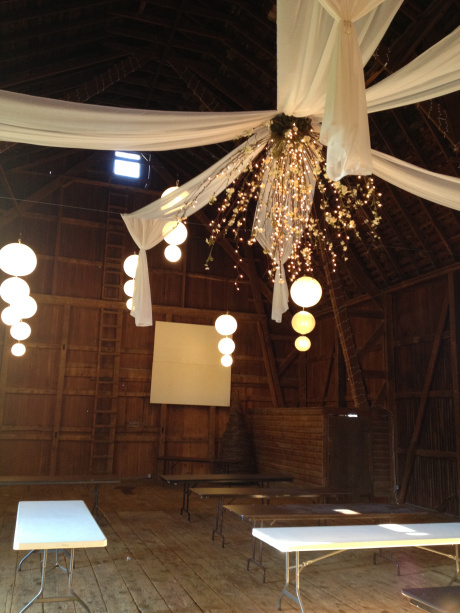 Right away when my mom sent me many many cell phone photos and we had a long conference call with my future MIL Patty, and the owner of the Wingate Barn, Dolores I knew that this was the venue for us. It comes with so many extra decorations and they are doing many upgrades this winter. I can just imagine it full of flowers and more twinkle lights. The long tables are included, and we are going to do them hall style (think Harry Potter). My Pinterest board is secret, and I think I am going to keep it that way, but I will probably do an inspiration post to show you all of my thoughts. My "theme" is rustic elegance, and my colors are ivory, khaki, lavender and gold. They didn't have any dates available next summer, so we opted to go with summer 2016. We got the perfect date. I mean freaking perfect. Dave and I are going to be getting married at the Wingate Barn, and then celebrating the night away with our friends and families on July 2, 2016. And then we will have the rest of the fourth of July weekend to have our honeymoon. How absolutely amazing is that stroke of luck. Also, my parents twenty seventh anniversary is July 3, 2016 which makes it even more special and full of love.